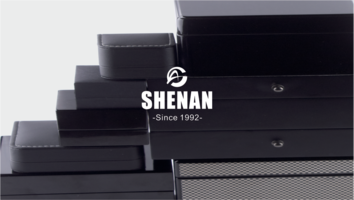 established in 1992,is a leading OEM company. With more than eighteen years' professional experience in the manufacturing and esportation of wooden,plastic,paper and leather packaging box/case est/winder and showing/dispaly facilities.As for our products,including jewelry box,gift box,watch box,perfume box,wine box,cufflink box,cosmetic box,stationery box,humidor,have been proved by scrupulous tests among customers in Worldwide. Piano finish wooden case with a handsome square shape, it is a perfect combination between simple and luxury. Inside in very soft hand velvet and fine structure design, it could bring you in deep impress about this box. Fully checks style around the case in piano finishing, strongly performance by transparent window top. Classic black premium soft sythetic leather, included quality five pillow. It could represent a supreme lifestyle. Red wine piano finish with full laser gorgeous pattern, show off in anywhere.Inside lining with lighting device, providing extraordinary shining moment for your product. Precious value would raising up to a whole different level with this package. Presenting watches feature by transparent window top, in classic high-end lacquered nice looking. Premium silver locker safeguard total 12 watches and keeping with soft hand synthetic leather. Color and size is available to customization. It is a very fashionable look packaging. Cute in circle cuting combing with nice fabric. Perfect match with gift. Shen An Gift Packaging Ltd.